Co-ordination is the key to dressing without having to spend time thinking about what goes together. 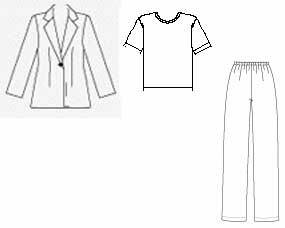 Using Eileen Fisher’s summer 2010 ‘system’ as a guide to a small wardrobe of current co-ordinates : this post is about the ‘bottoms’. I made some more general comments about co-ordination in my previous post on the ‘system’ tops. – short straight skirt in stretch crepe, with elastic waist, front and back darts. – cropped leggings in stretch jersey. – slim ankle jean in stretch denim, with contoured waist, back yoke, rivets, contrast stitching. These styles are all going to be around for a while. Simple skirts, leggings, jeans : they might be called ‘current classics’. – 1 to slob out. How would you assign these three ?! The tops in the Eileen Fisher ‘system’ are all very similar (see post). These ‘bottoms’ aren’t very similar, so what is the key to being able to use them interchangeably ? 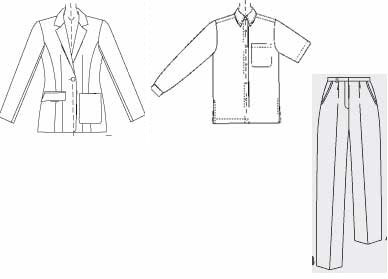 What are the common features which make for easy co-ordination with a variety of tops and layers ? – they’re all in the same colour, your best darker neutral. – they all have fitted waists, which are all at the same level (low). – they’re all neatly fitted over the hips and thighs, so will be okay under whatever length and ease of top or layer you wear them with. – they all have the same silhouette, in this case slim rather than big or flared. McCall’s 3830 is an obvious candidate for a straight skirt TNT pattern. Some people look better in a slightly tapered skirt. 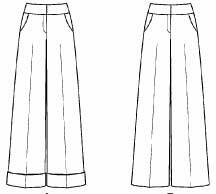 Elsewhere on the Eileen Fisher site, most of the skirts are just below knee length, all very classic shapes, either straight or slightly a-line. 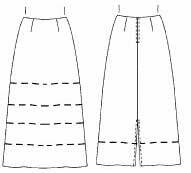 So use any favourite basic skirt pattern. 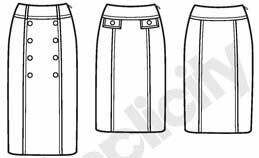 McCall’s 3341 is a pattern for a multi-length a-line skirt with faced waistband. Eileen Fisher’s ‘system’ includes a short skirt. I’ve never had the legs for short skirts (though I regret to say I did wear them in the late 60s / early 70s, as everyone did. There really is no way to disguise the bulginess of my knees.) Personally I think the tops and layers in the ‘system’ would also go with a longer skirt. Some people predict full length skirts are going to be fashionable this winter. This skirt has an elastic waist. Elastic waists gather up fabric, they’re bulky. So how does this skirt get a fairly smooth fit over the hips ? – waist measure plus twice length of opening such as a zip. So long as that is bigger than your hips, you’re alright. – or, have as much fabric at the waist as needed to go over the hips, and gather that up to hold it in round the waist. Problem with gathered waist : if your hips are a lot larger than your waist, there’s a lot of spare fabric scrunched up round your waist, which is actually only needed while you’re getting the garment on and off. 1. Put a skirt on over your head. 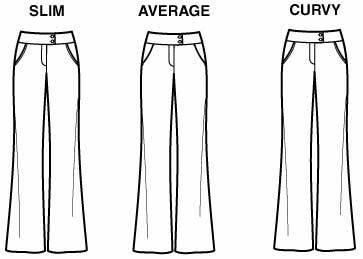 For everyone except inverted triangle shapes, who are larger above than below the waist, this means the waist only needs to be large enough to go over your upper body, not your hips (see ease post). 2. My hips spread 4 inches/ 10 cm when I sit down. So I need at least that much ease at the hips. But I don’t need that ease at the waist for pulling the garment on. Get rid of the excess with darts. 3. 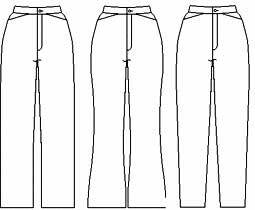 Use a low waist style – so the measurement at the top edge of the garment is closer to your hip measurement. 4. Use very stretchy fabric. 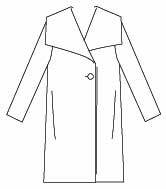 So it will stretch while you’re pulling the garment on, but relax to closer fitted when you’re wearing it. 5. 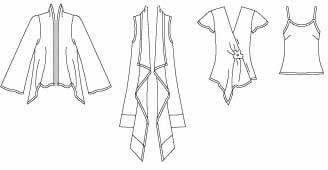 Use very soft fabric, so the gathers lay flat rather than bulging. This Eileen Fisher skirt uses most of these options. Most leggings patterns come from companies which specialise in patterns for knits or activewear. I personally haven’t tried leggings yet – I haven’t found any in a flattering colour. When I do, then I’ll start worrying whether they enhance my thickish legs. But make sure the bottom hem hits your leg at a flattering point. As leggings are close fitting, this is even more important than with skirts and pants. Though they’re made of very stretchy fabric, it’s still good to fit leggings. Any strain lines mean they’re uncomfortable to wear and will wear out quickly. Check if you need crotch extensions, so you don’t feel they’re cutting you in half. YouLookFab says leggings will be important for the coming winter too. Fashion jeans are tighter than pants. They have zero crotch depth ease, and are close fitting on the thigh. The effect is to enhance the view from the back. Jeans aren’t quick and easy to sew. They use special techniques. There’s a lot of useful jeans advice at Pattern Review in a jeans sewalong. I confess I have never had a back view to enhance, so I wear ‘trouser jeans’. Use a pants style amount of ease, made in denim and with jeans styling elements (back yoke, double top stitching, rivets). 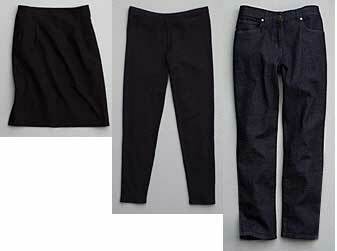 I don’t personally think classic jeans pockets are very slimming, see pear shape post. 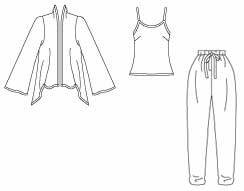 In the main section of the Eileen Fisher site, there are leggings, jeans, slim pants, straight legged and wide pants, knee length, calf length, ankle length, floor length. So pick what suits you best. Just make sure the hem of shorter pants is not at the widest part of your calf. These three styles, short skirts, cropped leggings, and fashion jeans, aren’t the most flattering possibilities for me. Though it’s interesting and useful to work out how they co-ordinate well and are interchangeable. Personally, if I was choosing a similar minimum wardrobe for myself, I would sustitute a longer skirt, and cropped and full length pants. But this disagreement set me off on a whole train of thought. 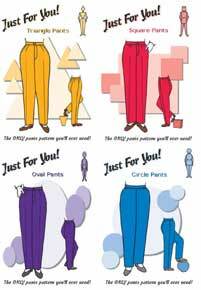 So I’m writing another post about pant style and body shape – just some thoughts, not complete answers !!! And my final post in this group on the ‘system’ is about the layering pieces. Patterns and links available June 2010. I suspect on the Eileen Fisher site what these links lead to changes each season. Wow, 201 hits yesterday ! Lots of possible topics in preparation : super quick jacket patterns; Eileen Fisher skirts and pants; Eileen Fisher layering pieces; pant styles for body shapes; eventually hopefully something on combining collars; trendy pant styles – probably now deferred until the new season’s styles are picked out by the local fashion magazines; hopefully I’ll find that little book of wardrobing advice written in the nineteenth century (“How to dress like a lady on £15 a year ” – what a lovely book title). . .
Just don’t expect a regular schedule ! !